We all need a little bit more love in our lives and there is nothing better than receiving a love letter written just to you. It is even more special when it is a love letter from God. In Christmas Love Letters from God Bible Stories, readers learn about the coming and birth of Jesus. The story is brought to life in this colorfully illustrated, creative page turning and flap-lifting (literally) book. The book is geared towards children, ages four to eight-years-old, but may also be enjoyed by children a few years older. “Isaiah’s Good News” tells of the message Isaiah hears from God announcing the coming of Jesus. Each story walks readers through a timeline, of sorts, as the message becomes truth. In “Bethlehem’s Road”, Mary and Joseph are entering Bethlehem just before the birth of Jesus. “Jesus Joy!” Welcomes Jesus into the world and the book finishes with the Wise Men, in “Wise Men’s Wonder”. You cannot tell the story of the birth of Jesus without the Wise Men. In each version of the stories author Glenys Nellist tells, she shares the Bible passage that references that part of the original story that tells of the birth of Jesus. At the end of each story is a personal love letter written to the reader of the book. The letter appears as a lift-the-flap on the page at the end of each story. A blank is left (ex: Dear _________) for you to write the name of the child who is the recipient of the book. Depending on the age of the child, you may let them write in their own name or you may want to complete it before reading the book to the child. A younger child may enjoy seeing their name already written in the book. Each Christmas love letter makes a note regarding the story it follows and closes with a reminder of how much God loves us. 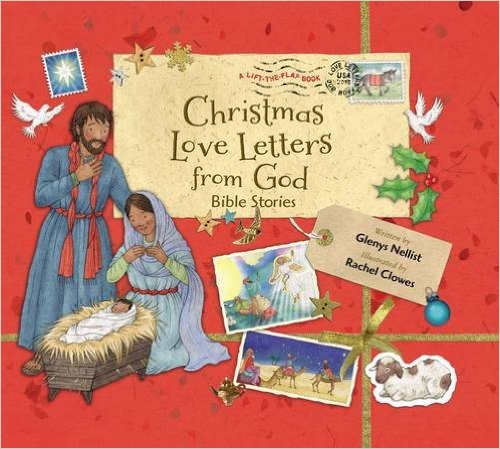 Christmas Love Letters from God Bible Stories is a book that tells a very familiar story – the birth of Jesus. There is the recanting of the story and very special love letters from God reminding us of how much He loves us, which was shown through the precious gift of Jesus. Guess what? Homeschool Roster has a copy of the Christmas Love Letters from God Bible Stories book for you to win.